Albuquerque, like many cities, is looking at bus rapid transit as a cost-effective way to improve mobility and create a more walkable city. Its BRT plan calls for frequent service on a center-running bus lane along Central Avenue, the city’s busiest bus route, which passes through the heart of downtown. The city has applied for funding from the Federal Transit Administration’s Small Smarts program. With $80 million in federal funds matched by $20 million in local funds, service could begin in 2017. But the local conversation about the project has been hijacked by outside groups with an anti-transit agenda. The most outspoken critics are a couple of men with financial ties to — are you ready? — the Koch brothers, fitting a pattern recently seen in Nashville, Boston, and a lot of other places. 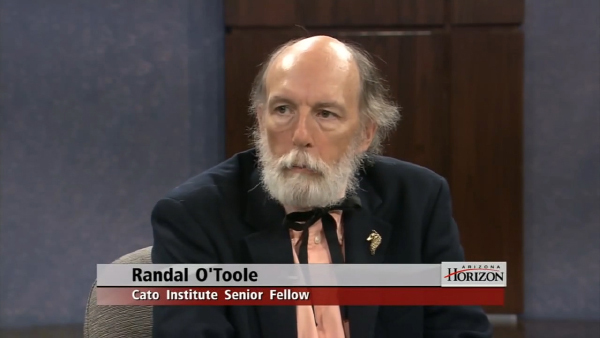 Naturally, the Rio Grande Foundation trotted out professional transit basher Randall O’Toole — of the Koch-backed Cato Institute — who tweaked his anti-rail road show in this case to criticize the bus plan. In the Albuquerque Journal, O’Toole said “transit will never be important in Albuquerque because Albuquerque jobs and residences are too spread out,” pointing out that only 1.75 percent of the city uses transit to get to work. (This actually sounds like a great argument for improving bus service as a means to make the city more walkable and draw more riders, but we digress). The city pointed out in its rebuttal that about 5 to 9 percent of the people living around the project rely on transit. The three bus routes serving the corridor carry about 10,000 passengers a day, or 44 percent of system ridership. Buses are frequently overcrowded and delayed during peak hours. Despite the cartoonishness of O’Toole’s arguments, he and Gussing are dominating the debate right now, says Dan Majewski of Urban ABQ, which represents downtown residents. A group of business owners along the corridor concerned with the removal of parking spaces and the disruption caused by construction are now aligning with the Rio Grande Foundation. Even members of Urban ABQ have some concerns about the proposal, Majewski said. But they think the pros and cons should be discussed in an atmosphere that’s not tainted by O’Toole’s brand of propaganda. The project is modeled after successful bus rapid transit projects like Cleveland’s Healthline, which has been credited with spurring billions of dollars in development along its route. 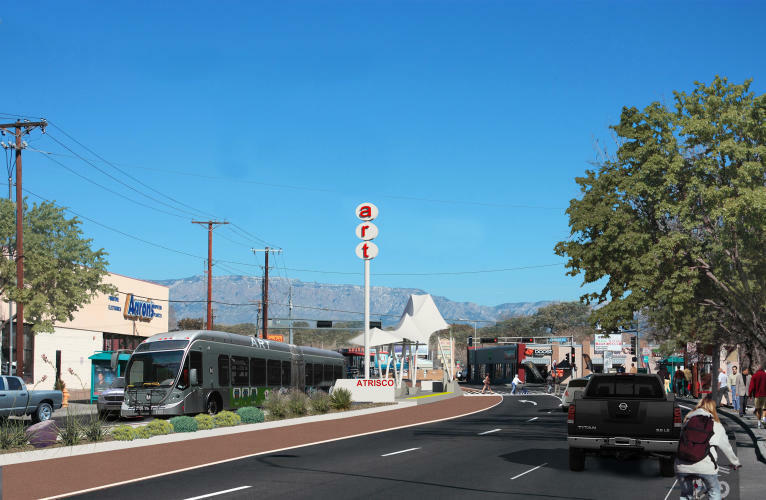 Majewski said one of the more attractive elements of the project is that it will result in a road diet on Central, which is the most dangerous street for pedestrians in Albuquerque (which is one of the most dangerous cities for walking in the country). Our city is a collection of mostly nondescript subdivisions connected by monotonous commercial strips, a concrete desert of very wide streets and hectares of parking lots. Officials like Mayor Richard J. Berry and Councilor Isaac Benton hope to capitalize on some of our distinctive neighborhoods to create an urban environment that will attract the people who will help create our city’s next economy. It would be a shame if the discussion Albuquerque residents want to have about their future gets drowned out by hired guns from out of town. “Hosting a national transportation expert” would be inviting David Gunn or Phillip Washington or maybe if you’re willing to go a bit more political, Jarrett Walker or Donald Shoup. O’Toole has been explained before: he’s a paid-for hack who will simply make stuff up in order to oppose rail and opposes buses. Canada has historically had a much stronger “anti-idiot” vote than the US. (Sigh.) When one side’s policies are just whackadoodle, Canada is more likely to toss the bums out. This is probably why crack-smoking mayor Rob Ford managed to lose his bid for re-election. The US seems capable of embracing whackadoodle for *decades*, much to our detriment. I like Republicans of your style. Your party abandoned you. As much as I dislike the Koch brothers, they have, unintentionally, come down on the right side of an issue. BRT is a hoax. It’s a way to claim that you’re putting in mass transit without actually doing it. 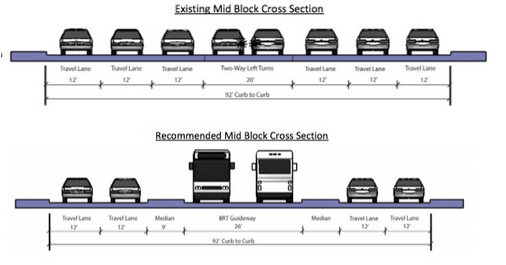 It’s very cheap, but it doesn’t attract new transit riders which is what’s necessary to reduce traffic. If there’s one good thing about BRT is that once it fails you can still use the buses for something else so at least the money for the vehicles was not wasted. Problem is, Mr. Gessing is ALSO a paid hack. He doesn’t live in Albuquerque, and he doesn’t represent its interests. He represents the interests of the fossil fuel industry and the greedy brothers Koch. Do you have to be a smug little millennial to post on this blog, because it appears that 90% or so of the comments would have that attribution. And you don’t believe that this idiotic plan for Albuquerque Rapid Transit is anything other than a big payday for local fat cats, do you? So, P.T. Barnum was right…..
You clearly have no idea what you’re talking about. And probably don’t even live in Albuquerque. If you think Central Avenue looks empty and bleak now wait until the affected businesses leave. If you don’t want to drive, don’t. But, I’ll bet you are one of the whiners who never ride the bus anyway. Mr. Gruber, I agree wholeheartedly! The issue should be voted on by the citizens of Albuquerque, not handed down by executive fiat by the Mayor and other political cronies who stand to benefit. Judging from the meetings I have been to, this idiotic project would be squashed once and for all. If you think there is outright corruption going on, please, go right ahead and prove it. I think you’re just against public transportation regardless of the form it comes in. Young people are leaving Albuquerque left, right, and center for cities similarly sized to ABQ but with stronger economies and stronger… you guessed it: public transportation. If you’re okay with the current status quo of Albuquerque, then by all means oppose this project. And, yes, people will make money off of the building of this project. Just like ANY development project. If you’re against that, but are unable to prove any corruption, then you need to get over it. Have some respect, human. I’m in my forties, was raised here since I was three years old (yeah, young enough that I wasn’t driving yet). I work downtown. So yeah, I know what I’m talking about, you twit. Now stop trolling every message you see here and do something productive with your life. Judging by parcel vacancy and urban decay on Central Ave (except downtown and at UNM), affected businesses have already left long before BRT was even an idea. I see from your profile you’re a frequent commenter on Breitbart News Network. Welcome to the world outside the echo chamber! Me too! Over nine years car-free in Albuquerque! And I am certainly no millennial!